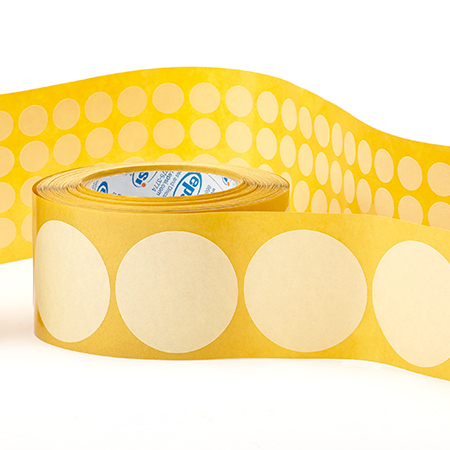 CD21 (PG-21) is a tan colored crepe paper masking tape with a rubber resin blended adhesive. Tape is laminated and discs are rotary die-cut on a specially formulated paper release liner. General masking applications in the industrial market including low temperature Powder Coating and Liquid Spray applications. Our CD21 (PG-21) is the industry standard in high performance crepe discs. They are high temperature pressure-sensitive masking discs designed for clean removal from a variety of surfaces after exposure to oven temperatures up to 325°F. CD21 (PG-21) discs perform well in wet strip applications. 0.125 Crepe Disc on Liner (3." 0.187 Crepe Disc on Liner (4." 0.250 Crepe Disc on Liner (6." 0.312 Crepe Disc on Liner (7." 0.375 Crepe Disc on Liner (9." 0.437 Crepe Disc on Liner (11"
0.500 Crepe Disc on Liner (12"
0.562 Crepe Disc on Liner (14"
0.625 Crepe Disc on Liner (15"
0.750 Crepe Disc on Liner (19"